Somanathpura is a village on the banks of the Cauvery river. Somanathapura lies in Mysore district of Karnataka. The village is famous for the Chennakeshava temple built by Somanatha, a general of the Hoysala King Narasimha III. 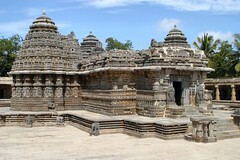 The temple was built around 1268 Ad and has striking similarities with temples at Belur and Halebid. The temple is highly symmetric and has stone carvings of events from hindu Mythology. The silent flowing Cauvery river is another attraction at Somanathpura. Best time to visit Somanathapura is August to February. Somanathapura has only a very few restaurants. Better restaurants are available at T Narsipur(10 km away) , Bannur(7km away) and Mysore (30km away). Nearest Lodging options are available at Mysore. Somanathapura is 140km from Bangalore. From Kalashipalayam bus stand at Bangalore KSRTC and private buses are available to Malavalli. From Malavalli(30km away) very few buses are available to Somanathapura. Another method is to reach Mysore by direct KSRTC or train services from Bangalore. From Mysore KSRTC and private buses are available to T Narsipur. From T Narsipur vey few buses are available to Somanathapura. Private cabs can be hired from Mysore.